Do you want to get a band 7 on the IELTS exam? Your preparation doesn’t have to be hard or boring! It can be fun! 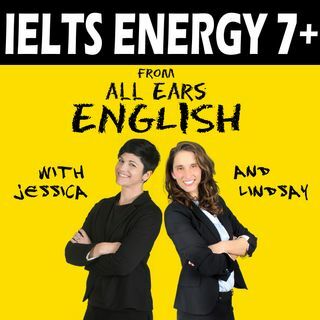 Lindsay and Jessica from All Ears English are back with a new way to help you achieve the IELTS score you need for the General or the Academic exam! We’ll give you strategies, practice, tips, tricks, and secrets using real English examples. We’ll show you how to take control of the Speaking Section by reducing anxiety, panic, and fear. You’ll learn what to do when your mind goes ... See More blank, how to organize your thoughts and how to use intonation, English pronunciation and native English vocabulary such as phrasal verbs and idioms to impress the examiner. You’ll find out which grammar points you should use on the Speaking Test and which ones you should avoid to get a band 7. You’ll also get guidance on how to prepare for Writing Task 1 and Writing Task 2 with help on the opinion essay, graphs and charts, and the argument or discursive essay. You’ll get tips on how to succeed with listening comprehension strategies and how to get the highest possible score on the reading test. You’ll find out how to use IELTS practice tests to get the maximum score increase to go from a 5 or 6 to a 7 or higher.